Thank you for taking such good care of me and for being so nice to me. I had a lot of fun and learned a lot. My mommy and I will really miss you! The Centre provided a caring and creative environment for him to learn and play in. My son has had experiences in the past year that went far beyond my expectations, with field trips to art galleries, museums, glass blowers and many others. 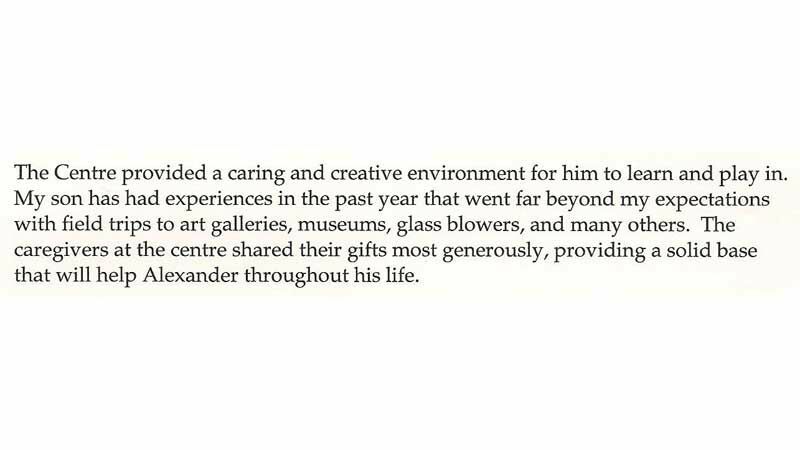 The caregivers at the Centre shared their gifts most generously, providing a solid base that will help Alexander throughout his life. Jessa has thoroughly enjoyed her days at Freedom, as have I, knowing that she is happy and safe. You and your staff provide a fun, warm, stimulating and friendly environment, which has reflected positively in my little girl’s development. I have highly recommended your care facility to others in the past and will continue to do so. Thank you for all you and your employees have done for Jessa and I. 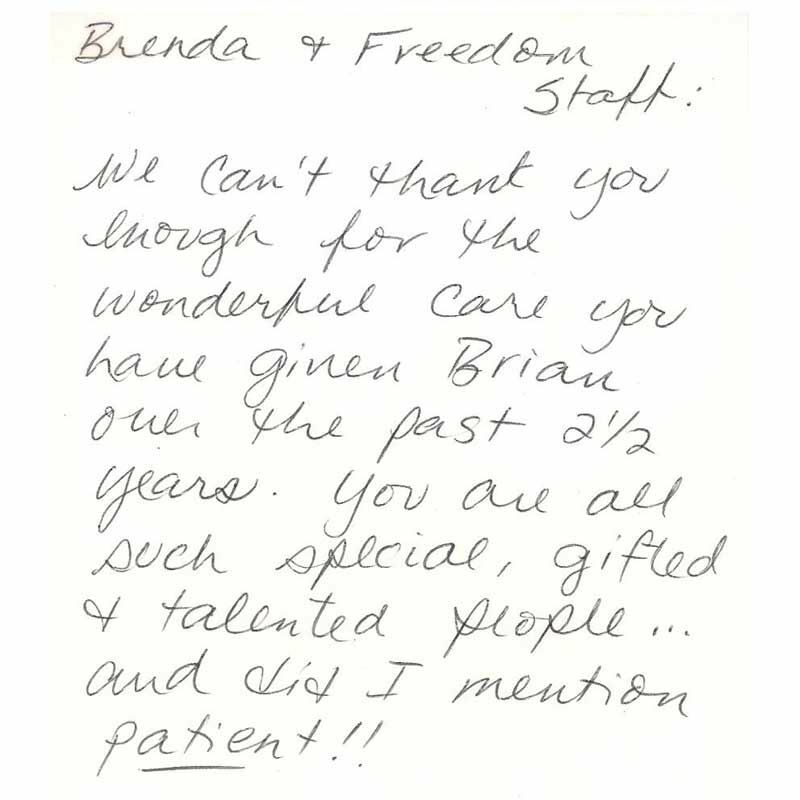 We can’t thank you enough for the wonderful care you have given Brian over the past 2½ years. You are all such special, gifted and talented people… and did I mention patient!! I would like to take this opportunity to thank both you and your incredible staff. 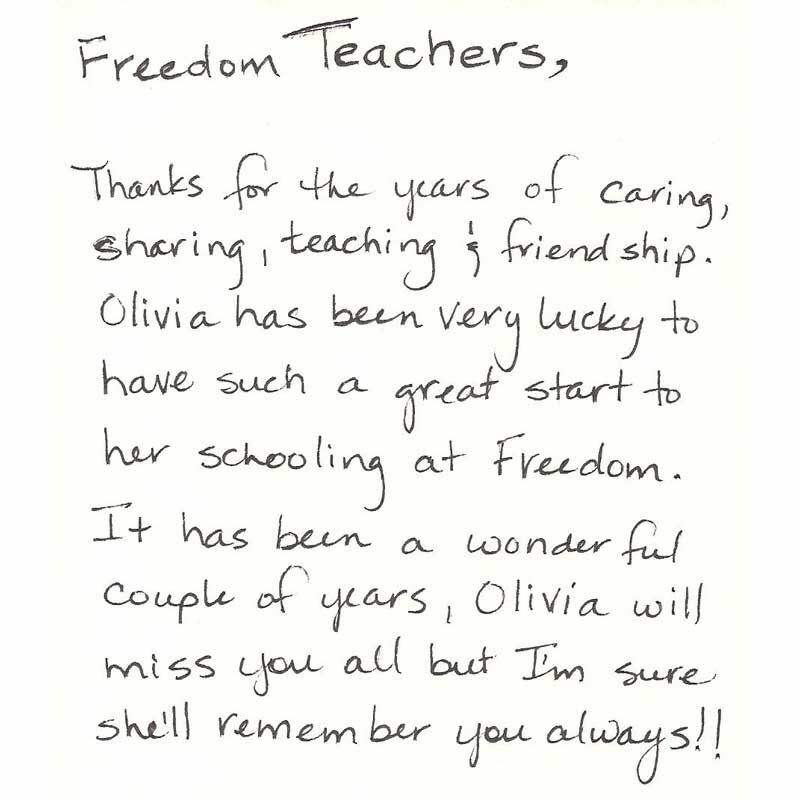 By far, Freedom has provided my family with the most superior child care. 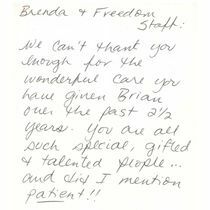 Brandon has always enjoyed being at Freedom and we will miss everyone there. He has really excelled with the support of your highly skilled staff. 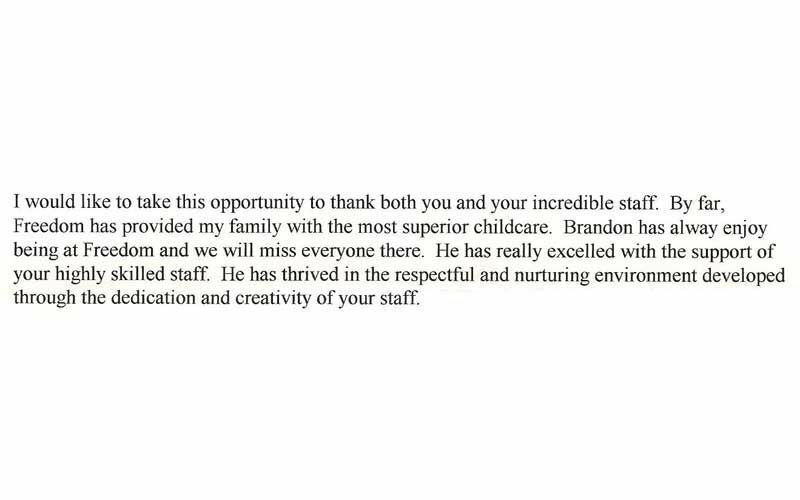 He has thrived in the respectful and nurturing environment developed through the dedication and creativity of your staff. 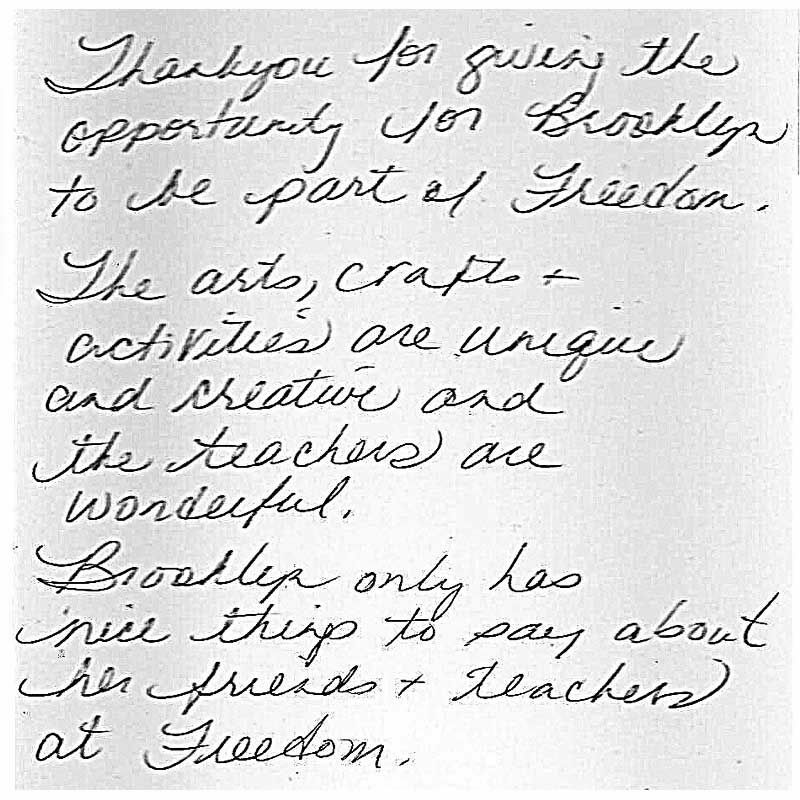 Thank you for giving the opportunity for Brooklyn to be part of Freedom. The arts and crafts and activities are unique and creative and the teachers are wonderful. 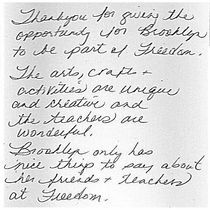 Brooklyn only has nice things to say about her friends and teachers at Freedom. Thanks for the years of caring, sharing, teaching and friendship. 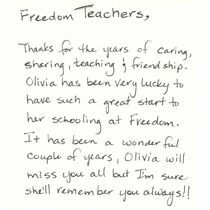 Olivia has been very lucky to have such a great start to her schooling at Freedom. It has been a wonderful couple of years. Olivia will miss you all, but I’m sure she’ll remember you always. 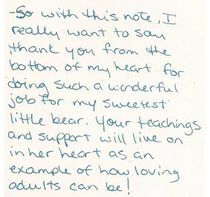 With this note I really want to say thank you from the bottom of my heart for doing such a wonderful job for my sweetest little bear. 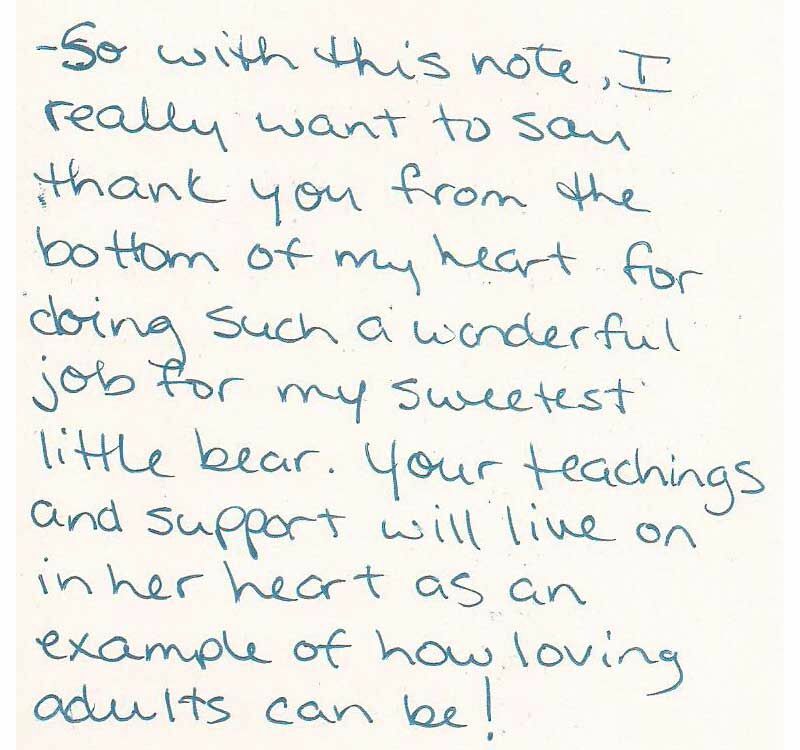 Your teachings and support will live on in her heart as an example of how loving adults can be!